Leon Golub. 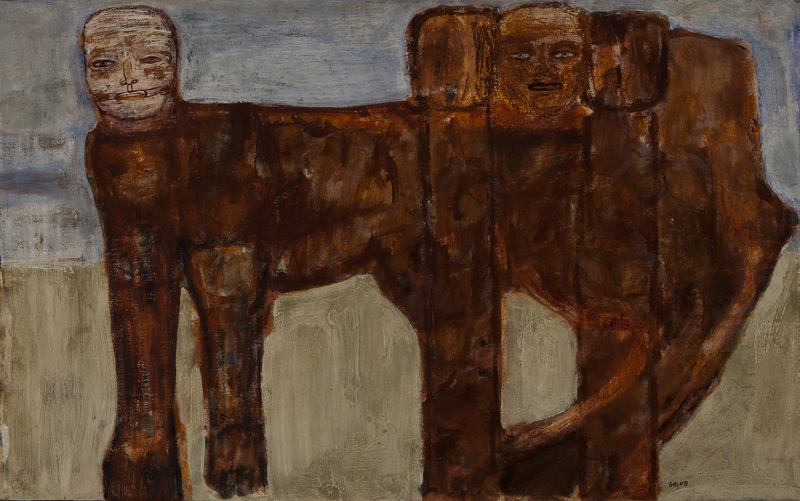 “The Ischian Sphinx,” 1956. Oil and lacquer on canvas. Collection of Ulrich and Harriet Meyer. Art © Estate of Leon Golub/Licensed by VAGA, New York. There are some pretty scary monsters in this show, especially those created by Fred Berger and Dominick Di Meo. These two could have designed album covers for death-metal bands. But most of these sixty-two pieces have something else in common: Like many examples in the adjacent exhibit, “Antecedents and Influences,” they address the universal rather than the personal, though Monster paintings have nothing like the dynamic pictorial space of Otto Dix, nor Monster sculpture the architectonic power of a Romanesque head. When you walk into yet another adjacent exhibit, “The Next Generation,” it’s as if you’ve escaped from a suffocating tomb. The Chicago Imagists also struck a defiant attitude, but their work feels bright, fun and playful. The Monster Roster is mostly grim, depressing and confused, as if overwhelmed by its morbid subject matter. There are many low points in this show. The “Birth of Death” series by Cosmo Campoli may echo votive figures at the Field Museum, but it’s the mytho-poetry of despair not survival. Is life supposed to be easy? Even more depressing is “Nightmare Figure 1,” a failed painting by Nancy Spero. She spent a year covering a figure with successive layers of gray and blue until it disappeared. Cosmo Campoli. “Birth of Death,” 1950-1951. Cast bronze. The high point of the show are ten figures by Leon Golub that seem to be honestly facing existence without religious or recently discredited social ideals. They are oversized, but I would call them heroic rather than monstrous, especially the 1959 “Reclining Youth” that echoes a Hellenistic altar to Zeus. There’s a rugged beauty to their surfaces, as might be found in wabi-sabi ceramics. They suggest the kind of therapy that teaches courage, resilience and understanding. For better or worse, the other work has less impact and seems well on the way to becoming more personal and whimsical. Cleverness and apparent skill may have been required to achieve recognition, but formal strength and beauty were the casualties of its forward march. The Monster Roster can proudly claim to be Chicago’s first homegrown art movement, but its legacy is more a defiant attitude toward prevailing tastes than an enduring vision that could enfold the worst with the best of human experience. Through June 12 at the Smart Museum of Art, 5550 South Greenwood.